Senior Belgian politician admits street celebrations broke out after deadly bombings, criticizes media's lack of coverage. In the days following terrorist attacks in Brussels, street celebrations broke out in several places in Belgium, the county’s vice prime minister said. 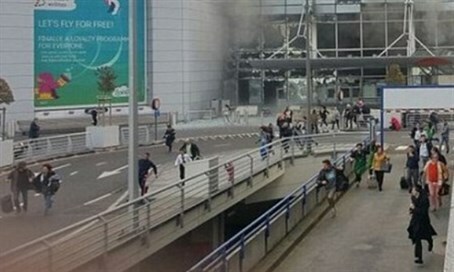 Jan Jambon made the statement about the March 22 bombings, which killed 32 people, on March 30 during a symposium titled “Terrorism, Israel and International Law” and organized by the Dutch anti-racism and pro-Israel lobby group CIDI, or the Center of Information and Documentation on Israel, in The Hague. Jambon, a rightist politician, made the remark while acknowledging Belgium has a jihadism problem. One of Europe’s smallest countries, Belgium is the continent's biggest per capita source of jihadists fighting in Syria and Iraq, CNN reported. In February, Jambon revealed Belgium’s intelligence services have flagged 451 citizens as jihadists. But, Jambon said, racial profiling of jihadists is ineffective. He also said jihadists hail from various backgrounds, “including doctors, lawyers, and common criminals,” and not only from poor environments. Only one in six jihadists comes from a poor home in Belgium, he said. Jambon urged better pan-European cooperation on terrorism. Jambon's statement on street celebrations follows criticism of the media’s failure to cover such events, including by the prime minister of the Flemish Region, one of the federal Belgian state’s three autonomous states. Flemish Prime Minister Geer Bourgeois said that shortly before the attacks, which are believed to have been the work of Islamic State terrorists, his region’s public broadcaster did not report on riots by Muslims. The attacks happened four days after the arrest of Salah Abdelslam, a suspected terrorist alleged to have been involved in terrorist attacks that killed 130 people in Paris last November. VRT, the Flemish public broadcaster, said it did not report about the incident for technical reasons and not out of a desire to silence it.